Arabella Huntington, better known as Mrs. Collis P. Huntington, was not merely fabulously wealthy; she was well educated, refined, and had achieved her place in society by rising from the teen-aged mistress of a middle-aged millionaire to his wife. She was also accustomed to getting her way. Problems between Arabella and the residents of East 38th Street, between Lexington and Park Avenues, arose in 1911. 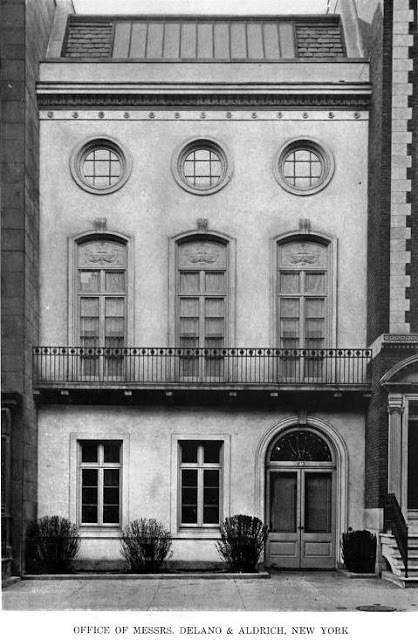 Collis P. Huntington’s former mansion stood at the corner of 38th Street and Park Avenue. His private stable, originally constructed for A. B. Embury during the construction boom following the end of the Civil War, was located nearby at No. 126 East 38th Street. Following the death of his first wife, Elizabeth, in 1883, Huntington transferred the deed of the mansion and carriage house to Arabella. Following their marriage a few months later, the newly legitimate Mrs. Huntington laid plans to elbow her way into society. In 1889 construction was begun on a massive Fifth Avenue mansion, directly across from those of Mary Mason Jones and Cornelius Vanderbilt. Having moved north by 1895, Arabella Huntington had no need for the mansion nor the private carriage house. Around 1908 she rented the residence to the Cornell University Club. 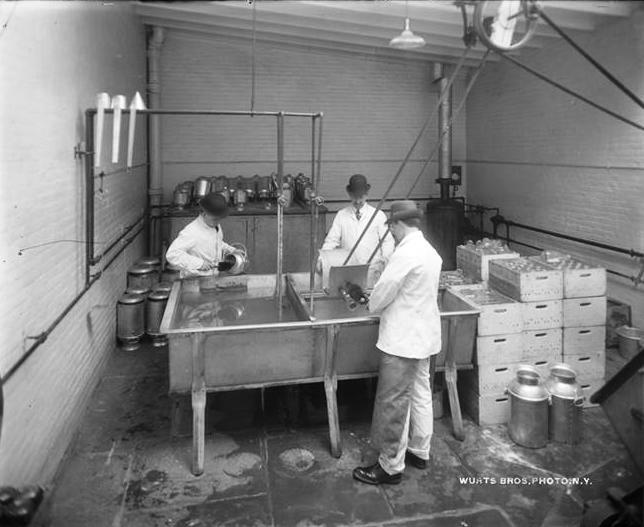 But when, around the same time, she leased the stable to a dairy for a processing plant her former Murray Hill neighbors were not pleased. Eventually the White Cross Milk Company’s lease was not renewed. Collis Huntington had died in 1900, leaving Arabella an inheritance of approximately $22 million. The other principal heir to Huntington’s $45 million estate was his nephew, Henry E. Huntington. The aunt and nephew pooled their fortunes by marrying in 1913. Delano & Aldrich was, by now, among the most prestigious architectural firms in the city. A favorite among the city’s millionaires, they designed elegant rowhouses and mansions, in addition to many other commissions. Delano & Aldrich now set to work transforming the stable building into their offices and studio. The renovations were completed within four months. A “removal announcement” was issued on November 11, 1916 and the firm moved into a drastically changed structure. The stucco-covered exterior had been transformed into what appeared to be a French Renaissance town home. High floor-to-ceiling openings lined up along the second floor behind a handsome iron-railed balcony. Round windows at the third floor provided special interest; and a broad skylight within the slate shingled attic level flooded the upper workrooms with natural light. Clients were welcomed in the reception room on the first floor. Here too was the library, hung with old Dutch paintings, and a view of the pretty garden to the rear. The second floor was taken up by the impressive offices of William Adams Delano and Chester Aldrich. The top floor was the large drafting room. While the firm worked on a staggering number of commissions—Peter Pennoyer and Anne Walker estimate in their The Architecture of Delano & Aldrich that more than 500 designs and alterations were completed in the 38th Street studio—Chester Aldrich also immersed himself in worthy causes. The year before the firm moved into its new studio, the Kips Bay Boys Club was formed to address the problem of vandalism being committed by “roving gangs of boys” in the neighborhood between 34th and 39th Streets. Chester Aldrich became its president, a position he would hold for two decades. The annual meetings of its management were held in Aldrich’s office here. He was also highly involved with a boys’ home on Staten Island that provided post-hospitalization rehabilitation. The Great Depression adversely influenced architectural commissions, resulting in many draftsmen being laid off. In 1932 Delano & Aldrich turned the upper floor into a factory of sorts to help the out-of-work designers. As Christmas neared in 1932, The New York Times reported "Fifteen doll houses, furnished to the last detail, are on exhibition at the Art Centre, 65 East Fifty-sixth Street, and will be shown until Christmas. They are for sale at prices ranging from $15 to $250 with the proceeds to go to unemployed draftsmen. The doll homes were built by Delano & Aldrich of 126 East Thirty-eighth Street, who have already received 350 orders, and who say they will turn the entire proceeds over to the relief fund, regardless of how many sales are made. Twenty-five cents admission is being charged for the exhibit." In 1935 Charles H. Aldrich was named Director of the American Academy in Rome. It signaled the end of his partnership in Delano & Aldrich as he left the United States forever. He died in Rome on December 26, 1940. Delano & Aldrich had produced impressive structures from the 38th Street studio building—including the Colony Club, the Union Club and the Harold I. Pratt mansion. But in August 1947 William Delano received a proposal which caused special attention. The letter was written by Matthew Connelly, Harry S. Truman’s appointments secretary. 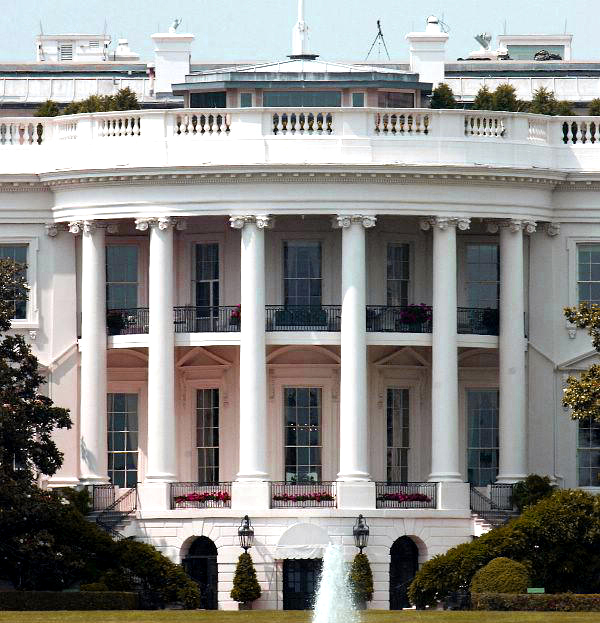 In it he explained that Truman deeply wanted a balcony added to the White House for the enjoyment of the First Family. That desire had sparked a heated disagreement between the President and the Washington D.C. Commission of Fine Arts. The Commission argued that altering the architecture simply to provide leisure space for the family was unacceptable. Its chairman, Gilmore David Clarke, wrote a letter to Truman harshly opposing the idea. Truman fired back, saying that the balcony would do away with the unattractive awnings which he deemed an eyesore. To break the stalemate, Truman turned to William Adams Delano. Connelly said the President would consider it “a special favor” if he would take on the project. He said that “your acceptance of this assignment would go a long way toward appeasing the small group who invariably oppose any additions of changes to the Executive Mansion.” Truman knew that not only had Delano & Aldrich replaced the White House roof for Calvin Coolidge, but Delano had been chairman of the Fine Arts Commission and was a friend of Gilmore Clarke. Delano took the job, designed the balcony, and convinced the Fine Arts Commission. Anticipating backlash, Truman personally paid for the $16,050.74 construction from a fund he had saved from his household account. Critics were forced to admit, after its completion, that Delano’s handsome balcony was an improvement to the White House architecture. Although he continued working, William Adams Delano left 38th Street not long after the Truman balcony was completed. In 1950 a newly-formed engineering firm, Praeger-Maguire Associates, took over No 126 East 38th Street. Today E. B. Marks Carlin American, Inc., music publisher, has called the building home for about two decades. Little has changed to the appearance of the old stable since its 1916 transformation by one of America’s preeminent architects. The calm, sophisticated façade belies the colorful history that played out inside throughout its nearly 150-year existence.